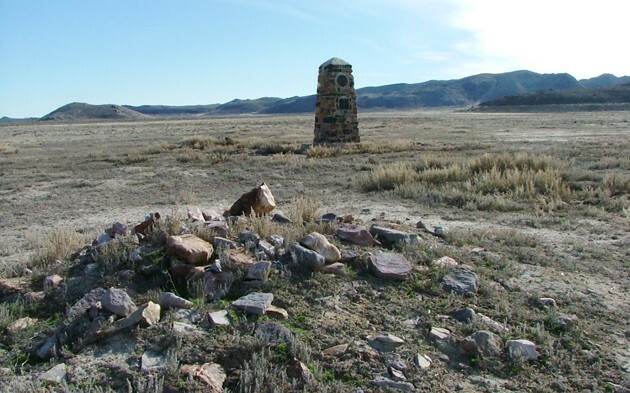 The concentrated stones in the foreground may be the remnants of the Dugway Pony Express Station. 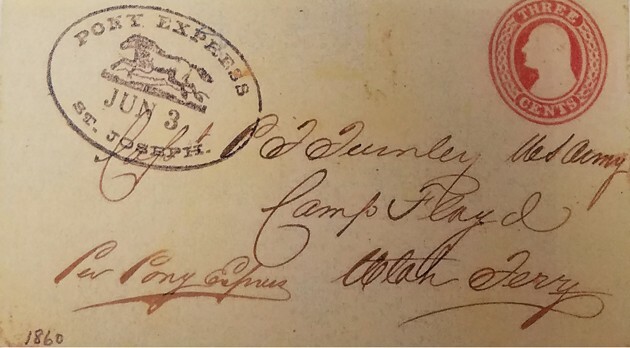 An actual envelope from the Pony Express Trail days dated June 3, 1860. Editor’s note: This is another installment in a multi-part series on exploring the Pony Express Trail through Tooele County. 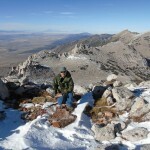 Last week’s article entailed the Dugway Station. Before moving west of the Dugway Station on the Pony Express Trail in Tooele County’s West Desert, there are more stories of hardship and conflict to be shared. 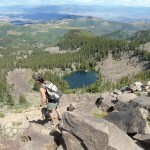 They suggest what life must have been like in those days beyond the edge of civilization. Howard Ransom Egan, son of Maj. Howard Egan and a Pony Express rider himself, described a project to dig a well at the desolate site in 1862. He stated that it was 113 feet deep and he was lowered all the way to the bottom where he carved his name on the side of the wall. Egan reported the workmen complained that the deeper they dug the well, the hotter it got down there. He also said the poor workmen used an auger to dig 40 feet deeper with no water still. “Then the job of trying more to find water there was given up and it made a nice place to dump the stable cleanings,” Egan said. The station men at Dugway had a hard life. I imagine the boredom and silence out in this isolated corner of the desert was probably not what they envisioned when they signed up to work for the Pony Express. These “draughty souls,” as Sir Richard Burton called them, were constantly out of whiskey and tobacco. I am sure that did not serve to boost their spirits. Even though this was possibly the most deplorable station along the route in our West Desert, it was also one of the most used. It was in service for the Overland Stage through 1868, and then again as a halfway station for the Walters and Mulliner Stage Company on its route from Fairfield to Ibapah back in 1890. Boredom was not the only challenge at Dugway Station. In April 1860, not long after the Pony Express Trail started, chaos broke loose on the trail due to an event that occurred hundreds of miles west at Williams Station in Nevada. Until then, relations between the Bannock and Paiute Indians in Western Nevada had been relatively peaceful. However, several Indian girls suddenly went missing and the Indians were understandably upset and suspicious of white men. A group of warriors discovered two girls in a hidden basement compartment at Williams Station. Enraged, the Indians burned the station and killed several of the men there. The local population was appalled that the Indians would attack and kill whites at the station, so a local militia was raised and a Maj. Ormsby led this force to Pyramid Lake to attack the Indians. Chief Numaga and his warriors ambushed Ormsby and killed half of his command including Ormsby. This series of events set the Pony Express Trail west of Salt Lake City on fire. Some riders were injured delivering the mail and station men in Nevada and western Utah were attacked and killed. This caused several riders to refuse to carry the mail, which effectively halted the service for weeks at a time. On one such occasion when the rider was unavailable due to Indian attack in central Nevada, the mail pouch was given to the Overland Stage, and when it reached Egan Station in Nevada, the driver turned it back over to the station men there. Pony Express rider William Frederick Fisher, known back in those days as “Billy” Fisher, volunteered to take the mail from that point to the next station. Little did he know that he would have to ride nonstop from Egan Canyon to Salt Lake City — over 300 miles in 30 hours using 8 horses and mules! Fisher didn’t intend to set a record on May 24, 1860, but many stations he rode to were burned or abandoned, so he kept going. The unwritten law for Pony Express riders was that if your relief rider wasn’t available, you would change horses and keep on going. It’s hard to understand how serious these riders took their jobs. Some of them were carrying correspondence from the President of the United States, or official dispatches to and from the garrison at Camp Floyd. Riders such as Fisher, Pony Bob Haslam and others, accomplished extraordinary feats because in their minds the mail just had to get through. The horses that the riders rode were superior to the Indian ponies and could generally be relied on to outpace an adversary. It was also the policy of the company that the rider would never fight unless there was no other option. If you visit the Dugway Station site today, stand at the remote monument and imagine how you would defend yourself from an Indian attack in such desolate, open surroundings. Similarly, imagine worn-out, terrified Billy Fisher charging past this station on his epic ride to Salt Lake City. At this point, he would have been 200 miles into the ride! At the station site, you can see rubble caved into several depressions where the wells may have been — just a short distance from the marker. The marker is the only thing rising out of the flat plain for miles around, and ever since it was constructed in 1939, it has been a favorite roost for raptors of the desert and is covered completely with their droppings. The marker and surrounding desolation is probably the most bleak and lonely site along the Pony Express Trail. I have visited this place in the pleasance of spring, heat of the summer, and gray silence of a light snow in winter. Dugway Station today is a place where you can be completely alone if you find that appealing. Just imagine the station men who lived and worked here and how the 24/7 silence of the desert must have weighed on them. To find the marker, as you approach the Dugway Range from the Old River Bed, watch for a 20-foot-high tank and watering trough on the south side of the road. This is the old Topaz Well. 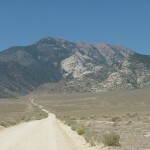 A road leaves the Pony Express Trail and heads south from there to Topaz Mountain and eventually Delta. Turn left at the tank and follow this road south for approximately 1.6 miles to where an old two track dirt road heads west. Take this road and follow it for .8 of a mile as it rambles across two minor drainages and you will end up at the bleak, lonesome obelisk marking the site of Dugway Station. 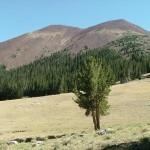 Dome-shaped, 5,091 foot-high Bittner Knoll rises out of the plain about a mile to the west from the station. If you want an interesting aerial view of the plain, climb the knoll and look back across the desert to Table Mountain and then down on the marker at Dugway Station. It is quite a panorama. The gray rhyolite of the Thomas Range, and the rugged crags of the Dugway Range to the north, present an imposing backdrop. As you survey the scene, ask yourself if $35 a month would have been enough to work in a place like this when the desert was filled with hostile Indians in the time of the Pony Express.